Canadian cycling legend Steve Bauer is making an ambitious attempt to put Canada on the world map in a tremendously difficult sport—cycling. He intends to lead the SpiderTech Powered by C10 team to the Tour de France, a feat never accomplished in Canadian history. No-one knows this better than Bauer, who won a silver medal in the 118-mile road race at the 1984 Olympics. No Canadian had won an Olympic medal in the road race before or since. TSN touts him as “the most prolific Canadian racer in the history of the Tour de France.” He has worn the coveted yellow jersey at the Tour an impressive 14 times. Bauer’s goal is to lead the first Canadian team to the Tour. He is now working hard to make that goal a reality, with SpiderTech powered by C10: Canada’s first and only professional continental cycling team. Now, four years later, SpiderTech has achieved Division 2 status as a continental professional team—the first level the International Cycling Union (UCI)) recognizes as professional. This is an incredible achievement for a country where hockey is king. Still, there is no shortage of Canadian cycling talent for Bauer to draw from. In his fourth season as team director, Bauer has assembled a team of 17 world class riders, including 11 Canadians. The team is young, with an average age of 26, but has depth and experience. Watching cycling on TV doesn’t do justice to the distance, speed and mountains cyclists blast their way up. These athletes are among the fittest in the world. Back in 1991, Steve Bauer’s cardiorespiratory and muscular systems were measured at a fitness test at Concordia University where he spun from a low- to a high-level of intensity. The scientists were able to measure his power output. Most elite cyclists can put out around 300 watts of power in an hour; regular people put out only 150 watts. Bauer maxed out the test bike—working at about 425 watts. The scientists expected Bauer’s workload could have gone as high as 500 watts. To put all this in perspective, if Bauer were riding a power-generating bike, he could light up seven 60-Watt light bulbs for an hour. An “average Joe” could only power two. Couple this inhuman strength with endurance: a stage race is like running a marathon or two a day, back-to-back to back to-back. In comparison, the Tour de France is the same as riding from Calgary to Toronto in three weeks, but doing it in four to five-hour sprints over the French Alps. These athletes are tough. In April SpiderTech completed a team time trial in Italy, finishing 10th out of 17 teams. 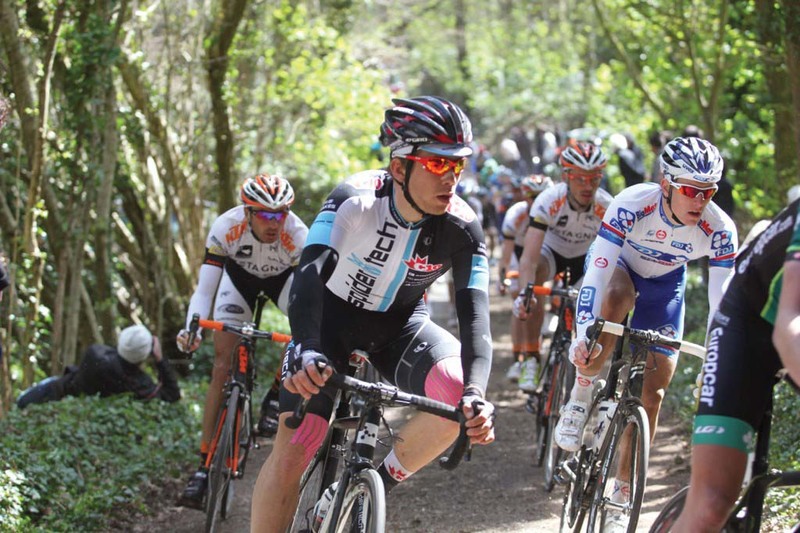 A few days before, Ryan Roth won SpiderTech’s first UCI Europe Tour race in Tro Bro Leon, France. Teammate Guillaume Boivin—a World Championship bronze medalist in 2010—placed third in the one-day, 206km road race. Every member of the team sports an impressive curriculum vitae: Zach Bell captured a bronze at the London 2012 track trial event earlier this year, and Bauer says he has “a great chance at a medal and a good chance to even win” at the Games this summer. David Boilyand Hugo Houle, both 22, are up-and-comers to watch. “We’re trying to build a foundation of Canadian strength,” says Bauer. Bauer is enthusiastic about the team’s ability to race competitively on the World Tour (the highest level of competition) in two years. The Tour could come as early as 2014. As president and founder of PowerWatts, Saldanha is the mastermind behind the development of the system. He holds a master’s degree in exercise physiology from McGill University and is a certified strength and conditioning specialist. A former professional Ironman triathlete, Canadian national master’s road champion and finisher of the grueling Race across America, his motivation in creating the PowerWatts system was to meet the needs of both elite and recreational cyclists in their quest for ultimate performance. PowerWatts measures everything from an athlete’s blood lactate to strength to biomechanical and video analysis (pedal stroke or gait analysis). It’s serious training gone high-tech. 1. Set realistic personal goals and power through the muscle pain, but not the joint pain. 2. Keep pedaling and your endurance will build. 3. Have your bike properly fitted. Match this fit to your flexibility and type of riding. 4. Get involved with a cycling club or group rides. Learn from others. 5. When going uphill, don’t over muscle it. Use your gears to maintain adjust your cadence. Conserve energy by staying in the saddle. 6. While descending, “feather your brakes,” applying subtle and occasional intermittent pressure. 7. Change your hand and body position frequently to maintain comfort. 8. Stay relaxed. Keep your arms relaxed and don’t lock your elbows. 9. For longer rides, hydrate and ensure you’re replacing calories and electrolytes as you ride. Sprinter Adrienne Power has overcome many obstacles to become the fastest woman in Canada over 200 metres.